So once again I have grown somewhat lazy about posting my daily exploits. Apologies to my committed fan base. While I’ve been lacking in the blogging department, I have been keeping up with my schedule. I even skipped my precious rest day to catch up so my week starts on Sundays again. Since my last post, I’ve completed: Legs & Back with Ab Ripper X, Cardio Power & Resistance, Chest & Back with Ab Ripper X and Plyometric Cardio Circuit. Carorie burn (and effort) is still high, but diminishing with each iteration of a routine. Ever since that last hike I went on, my right knee has been popping every time I start moving after being seated for a short while. Once it pops and I’m moving around, it’s good. But it’s yet another weirdness I’ve been dealing with. I played some mixed doubles tennis on Sunday. So I was somewhat concerned about the knee. I walked around gingerly checking everything during the warmup and took extra time to stretch before the match. Once I started moving, everything was fine. I suspect the Heismans are aggravating the knee. We won our match, but the main thing I was checking was movement and I was satisfied with that. It was also a beautiful, sunny day. 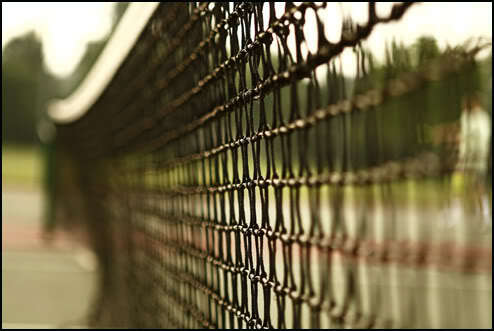 The spring singles tennis season is coming up fast. Looking forward to that. This entry was posted in P90X-Insanity Hybrid, Round 4 and tagged Ab Ripper X, Cardio Power & Resistance, Chest & Back, Legs & Back, Plyometric Cardio Circuit, Rest, Tennis. Bookmark the permalink. 2 weeks down already and it’s still painful to go through some routines. Abs workouts are nowhere as efficient as they were previous round. I’m just thankful I don’t feel really sore anymore and pull-up totals keep increasing. I can’t wait until weather is fine enough for outdoor runs. * You might want to read up on “Patellofemoral Pain Syndrome” which might be the issue with your knee. Keep at it! I don’t think that’s what my knee issue is….but thanks.